In the wake of the disastrous 2016 election cycle that left us with a conman turned reality TV star as President, the media has suddenly decided the whole thing can be blamed on too much fake news. How else to explain the words “President” and “Donald Trump” combined together in one sentence without adding “will never be” between them? Voters must have been swayed by fake news not to select saintly Hillary Clinton against Trump. Oh! What a spotless angel she was that everyone loved without reservation and there was never any warning that trouble might be brewing so it must be that those regular folks were swayed by false stories, otherwise… I mean why wouldn’t they vote for Clinton? She was just so great and we were paid to say that, but whatever. Sure Trump won with an unheard of 60% unfavorability rating on election day. Sure even 17% of his own voters said he was unqualified for the job on election day! Sure millions of Democrats in the primary who supported Bernie Sanders were turned away from the polls, had their party affiliation mysteriously changed, and/or had to wait in ridiculously long lines while the news media called the race for Hillary before polls even opened! That certainly wouldn’t have had any impact on the general election! Sure voters everywhere made it clear the last thing they wanted was an establishment candidate and the Democrats ran the most establishment candidate of all time but it couldn’t be that the Democrats did anything wrong! No! IT. HAD. TO. BE. FAKE! NEEEEWWWWWWWSSSSSSS!!!!!!!!!!!!!! I’d like to postulate a theory – it wasn’t that too many people paid attention to stories that weren’t true. (Those email leaks from the DNC may or may not have been hacked by the Russians, but they were written by actual Democratic party operatives and proved the party to be just as corrupt as cynics claimed.) Maybe the problem wasn’t what people read – it’s what they didn’t read. It’s not the falsities that were out there but the truths that we refused to acknowledge. We ignored the deep truths about Hillary’s unfavorables. We ignored the deep truths that the Democrats haven’t done much for working people in years. That Democrats rely on minority votes to get into office, but once they get there, they pass few policies to actually improve the lives of people of color. That Democrats like Obama and Clinton support almost the same damn corporate education reform policies of the Bushes, the Waltons, and the Kochs. As a public school teacher, the father of a school-age child and an education blogger, that last point is the most obvious to me. There is so little daylight between Democrats and Republicans when it comes to public schools. Teachers and working people used to be a key constituency for Democrats. More than 90 percent of all US children go to public schools. Listening to the needs of teachers, students, parents and communities would seem to be a winning strategy. But instead – here as almost everywhere else – the Democrats continue to be the party of the donor class and not the working class. And for this remarkable sell-out, they get only a fraction of the campaign contributions of the Republicans. They’re weak, spineless and cheaply bought. Wait a minute. Someone did. Many someones. People like me wrote our fingers to the bone explicating the wrongs being done to our children, the civil rights violations being ignored and the errors of progressive party policy. In that spirit, I’d like to offer a countdown of five stories from my own blog this year that I thought were pretty important but only got limited attention. To repeat, these aren’t my most popular stories. I provided a countdown of my ten most read articles of 2016 a few days ago. Instead, these are pieces that were read but not as much as they should have been. I’m used to being a Cassandra, and nothing can be done but to cement that role in the history of the year that was. But the New Year beckons. With it comes new opportunities, new hopes. The Trump administration will be easily defeated. They are greedy fools who are taking office with the highest unfavorability ratings in history. And given their stated plans to enrich themselves at taxpayer expense, that’s only likely to get worse for them. What concerns me is the progressive response. We will get a chance to challenge Trump. But who will we be – the second choice to do the one percenters bidding? Or an authentic movement of people-powered progress? Description: Standardized testing is the keystone of modern education policy. High test scores are how we determine if students, their schools and their teachers are a success. However, these tests are based on racist eugenics theories about human biology and have been used throughout our history to enforce the existing social structure. They were literally an inspiration to the Nazis and though terms have changed post-Nuremberg Trials, our modern tests rely on the same implicit social and economic biases. Yet no one dares discontinue them. In fact, they are held up as being necessary to ensure civil rights when they actually ensure that students rights will continue to be violated. Fun Fact: When I wrote the first article, readers were shocked by the connection I researched between the creation of American tests like the SAT and Nazi Germany. Some simply refused to accept it because it was too in your face. I wrote the second article to make a similar point more gently. The facts presented here should be common knowledge and spark protests nationwide. Instead, they are treated like secrets when all that is needed to uncover them is a library card, internet connection and a critical mind. Description: It was obvious to many campaign watchers that the Democrats were all but giving up the general election to the Republicans. If you only paid attention to the media talking heads, Hillary Clinton’s candidacy seemed like a slam dunk. But if you looked at the facts, the truth was laid bare. The disaster that will be the Trump administration could have been avoided. I called it here. Fun Fact: It’s hard to think of anything fun with inauguration day coming so soon. I wish I had been wrong. But even more I wish that progressives will learn their lesson from this travesty and become all the stronger for it. Only time will tell. Description: Public Schools are big business, and that’s the first problem with them. Schools should never be about making a profit. They should be about educating children, first, second and third. However, lawmakers on both sides of the aisle think it’s just perfect to use them as a vehicle for personal economic gain. Charter schools, in particular, are a super easy way to generate tons of cash at taxpayer expense without having to put hardly any effort into the act of educating. This article can be used as a blueprint to get rich or a vomit bag for anyone disgusted at what we’ve allowed happen to our system of public education. Fun Fact: I’m hoping for vomit and outrage. Still waiting. And hoping for the best. Description: Pittsburgh, the town of my birth. This one hits close to home but is indicative of what’s going on across the nation. Wealthy elites are using our perverted tax and campaign finance laws to attempt to steal control of our duly-elected school boards. Public schools are some of the last truly democratic institutions left in this country. That’s why the rich are funding attacks against them. They don’t want Joe and Jane taxpayer to have any say in their kids’ schools. So they gather money, meet at private fundraisers and draw their plans against us. Pittsburgh voters have turned away from the plutocrats plans of late and that’s something the upper crust simply will not accept. Fun Fact: So far we’ve been winning this battle along the three rivers. Fingers crossed that votes will continue to triumph over cash. Description: It’s all about the children. That’s what everyone says as they pass laws to pull the rug out from under them. Take Exxon CEO and soon-to-be Secretary of State Rex Tillerson. Last year, he had the gall to complain about struggling students in impoverished public schools. He called them “defective products” as if they were irregular widgets stamped out in a factory. I wasn’t having it. However, this attitude shows exactly how the powerful view our children. They have no intrinsic value. They only matter if they meet the needs of business – society has no responsibility to meet their needs, only that of the corporations and CEOs. Fun Fact: The media turned this story into a case of a famous man misspeaking. But he didn’t misspeak. This is a rare case of someone saying what he actually thinks. No one held him accountable and now he will reap the rewards of the in-crowd – power in the Trump administration. When will we hold cowards like this accountable? When will we rise up and throw them out of the corridors of power? Perhaps on the same day that we stop harping about “fake news” and start paying attention to what’s actually going on around us. Is it just me or did 2016 really stink? Both personally and publicly, it was a year I’d rather not revisit. I lost family. I lost idols (RIP, David Bowie and Prince). And we lost a horrible, protracted Presidential election. But as has become a tradition, I find myself in front of the computer compelled to compile this list of the best of my own writings. It would be easy to just say nothing much of value happened in 2016 so let’s just move on. But that wouldn’t be true. There were good things. I’m just stumped to remember many of them right now. Perhaps as time goes on we’ll look back fondly on a smattering of events from this year that was. Bob Dylan won the Nobel Prize for Literature. That was kinda cool. There were some decent movies and a heck of a lot of good TV shows. The Arrival, Star Trek Beyond, Deadpool… Game of Thrones, American Horror Story, two excellent series about O. J. Simpson. We got a Harry Potter sequel of sorts – and another movie! I thought “Underground Airlines” by Ben H. Winters was quite good. We got an amazing musical in Lin-Manuel Miranda’s “Hamilton.” Technically it opened in 2015, but it swept the Tonys this year. And hey! We stopped the Dakota Access Pipeline – for now. It was certainly a productive year for blogging. There was so much to write about. This little education and civil rights blog went into overtime. I almost doubled traffic to the Website and got 2,145 more followers for a total of 11,335. 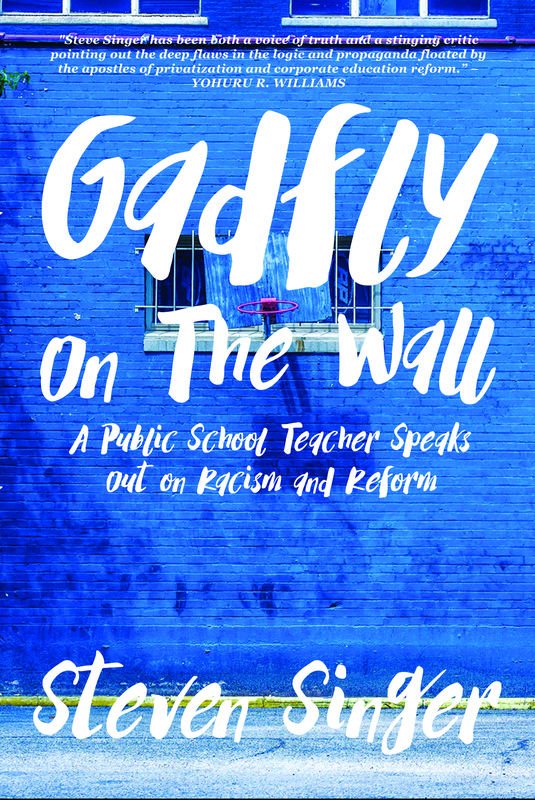 Gadflyonthewallblog, or if you prefer Gadfly on the Wall Blog, has been going strong since July 2014. In those two and a half years, I’ve gotten 849,000 hits – 363,000 just this year, alone. I also increased the number of posts I write a year. Last year, I only managed about 90 posts. This year it was 120 posts – a full 30 additional articles. I hope you’ve enjoyed them. I hope you’ve found them valuable. Sometimes readers send me a note saying that they’re going to share this post or that post with their school board or their representative in the House or Senate. I’m always very flattered to hear that something I wrote is helping someone else fight for what’s right. Of course, I do get a lot of hate mail, too. No death threats yet, but it’s getting awfully close. Readers have wished I was dead, but no one has offered to give me that little push to the other side. I hope that no matter what your reaction, you’ll remember these are just the writings of a humble public school teacher and father. No one pays me, though sometimes I do get donations for the right to reprint something elsewhere. I write all this stuff because I have to. So few people seem to care what people like me have to say – even in my own profession. Like many others, I’ve stopped waiting to be asked. So for your end of the year amusement, I offer this top ten list of my most popular writing from 2016. And here’s to a better 2017. Description: Some crazy lady didn’t want to pay the union for benefits that she got as a member and didn’t want to give them up. And rich folks everywhere had her back. They slobbered all over and pushed forward a bull crap case through the Supreme Court that probably would have made it much more difficult for labor unions everywhere had not Justice Antonin Scalia died deadlocking the vote. This article was my attempt to show how absolutely absurd the argument was against being forced to pay for something that benefits you. Fun Fact: Now that Congress blocked President Obama’s Constitutional right to appoint a replacement for Scalia, and Donald Trump will probably get to pick a replacement, look for a similar case to come down the pike and win! Oh, 2016, will you ever truly leave? Description: Charter school promoters often sell these institutions to minorities as being “Separate but Equal.” Hm. Didn’t Brown v. Board outlaw that kind of practice because if schools were separate, they usually were anything but equal? This article is my attempt to explain how charter marketers are really selling minorities on segregation and trying to talk them out of their own civil rights. Fun Fact: During the Obama years, it was common practice to sell corporate education reform as a way of increasing civil rights while it actually violated them. It will be interesting to see if that rhetoric gets left behind in the Trump years when lawmakers already seem to have little interest in them at all. Description: When John King became temporary Secretary of Education, he went on an apology tour telling educators that the federal government was sorry for how terribly it had treated teachers. In particular, he was sorry the department had blamed educators for societal problems that our schools need to fix without giving them the resources necessary to actually correct them. However, King was personally guilty of many of these same practices in his old job in New York. It was typical disingenuousness from the Obama administration and the Democrats – ignore and abuse their key constituents until election time and then make positive noises in their general direction hoping we’d support them at the polls. Fun Fact: It didn’t work. Description: The way we fund public schools in this country is messed up. In many states, we rely heavily on local property taxes which result in poor communities being substantially underfunded and rich ones having more than enough of everything. In most of the world, funding is done much differently – the burden is handled mostly by the federal government who then distributes it equitably from place-to-place. Bernie Sanders proved he was the real deal by suggesting we do the same thing here in the US, a suggestion that no one in either party was ready for. Fun Fact: Even some of my readers were uncomfortable with this one. They feared that if the federal government took responsibility for funding, it would increase their ability to micromanage local school districts. This is a fair concern, but there is a way to do this without increasing federal control of education policy, just funding. In any case, funding disparity is an issue that hardly ever even gets acknowledged less than discussed. Thank you, Bernie! Description: Just about every teacher gets crap from non-educators about summer break. Everyone thinks they know what it’s like to be a teacher and how easy we’ve got it. This post was my way of shutting up the ignorant. It explains why educators aren’t teaching in summer, what they’re actually doing and how the public benefits from giving teachers this time. Share it with someone you love. Fun Fact: Or just shut someone up with it. Description: Hillary Clinton’s campaign manager, John Podesta, is not a nice man. I unearthed a speech he gave to corporate school reformers including Jeb Bush in 2012 where he pledges his allegiance to conservative, market-driven school policies. And THIS is the guy who was influencing Hillary’s approach just like he influenced Obama’s when he worked on that campaign. Legend has it, Podesta is responsible for giving us Arne Duncan. He suggested Duncan over Obama’s campaign education advisor Linda Darling Hammond, a critic of high stakes testing. These were truths that needed to be told and tell them I did. Fun Fact: That this came out was a huge embarrassment to the Clinton campaign. All they could do was suppress it. Even dedicated supporters who read the article had to admit that she would probably not be very good for education – but she’d be better than Trump. It’s these kinds of Faustian bargains that derailed her campaign. How much better off we would have been had we had a real progressive to vote for than just another Democrat in Name Only! Description: Scalia was a terrible Supreme Court judge who used his position to justify hurting a lot of people. While others tried to hide their excitement at his passing, I let mine show. It might not be nice to say, but the world is a better place without him in it. I had hoped my honesty would make it harder for anyone like him to ever reach that office again. Unfortunately, weak Democrats and an incoming Republican President mean his replacement will probably be just as bad as he was. Fun Fact: Originally my title was much more provocative – something like “Antonin Scalia was a Terrible Person and I’m Glad He is Dead.” It got over 10,000 hits in a few hours, but then I reconsidered and changed the title. People almost immediately stopped reading it. Description: We often talk about black people as victims. Police brutality, civil rights violations, economic disparities – but this is only half of the story. There is a buried history of success that rarely gets mentioned. Think of what American culture would look like without black people. It would be something completely different. This was my attempt to tip my hat at the incredible ways black Americans have made their mark on our society especially in the field of music. Fun Fact: Black Twitter really liked this article. It was especially gratifying to see how appreciative people were. Of course, at the same time, some folks’ white fragility couldn’t handle it, either. Some readers tried to bully me into making changes here or there for no reason other than that it made black people look too good. Sorry, folks, no one determines what I put on this blog but me. Description: School choice is less an education policy than a propaganda effort. Most people don’t understand what it really is. They don’t understand how essentially selfish it is like cutting a piece of pie from the middle of the dish so no one else can get a whole slice. I tried here in the most simple, direct language I could to explain why. Fun Fact: With the nomination of Betsy DeVos for Education Secretary and Trumps’ promise to spread school choice across the land like a Trump University franchise, the article remains popular. A lot of readers told me that it helped make sense of the issue for them for the first time. No doubt it’s been sent to policymakers across the nation. And it all started when I saw that picture of a ruined pumpkin pie on Reddit. I started to think – isn’t that a lot like school choice? Description: Both Democrats and Republicans love school choice. So I thought that real education advocates needed a quick list of the main reasons why it is bad policy. There’s nothing really new or amazing here. We’ve known this for decades, but this keeps getting brought up again and again like zombie legislation. The wealthy will push this forward whether we want it or not. There’s just too much money they can make if it passes. That’s why it’s good to know why what they’re peddling is so harmful to students, parents and communities. Consider it ammunition for quick come backs. Fun Fact: I wrote this long before the Trump administration was a prospect to be taken seriously. This was long before DeVos or the Donald pledged to bring this to the national stage. It has continuously gotten a steady flow of hits since it was published. If my goal as a blogger is to be useful, I think this post more than any other written this year fits the bill. You can quibble with one or two points here, but all ten are enough to show any rational person why school choice is no choice.